PLEASE READ THESE TERMS CAREFULLY, SINCE YOUR USE OF ANY OF THE SERVICES CONSTITUTES ACCEPTANCE OF THESE TERMS AND CREATES A BINDING LEGAL AGREEMENT. All books published on with EduPedia Publications is subject to copyright of the Author and EduPedia Publications. For all literary, Academic and Research Purposes all our books can be freely quoted in such articles and reports. Duly quoted articles from the website will be deemed to be authorized by the EduPedia Publications on behalf of the authors. Author’s Surname, Name (Year like 2013), Italicised Text to name the title of the book, URL of the book, Accessed on (Mention date like 3 Septemper 2013). EduPedia Publications provides writing and publishing services to poets and writers. This is also a platform for sharing ones original ideas with the global audience. Digital Copy of books (“Content”) are accepted by EduPedia Publications to be converted to print form when it is ordered or to be sold in electronic form as authorized. The terms and conditions set forth in this document apply to all visitors (“Users” or “you”) to EduPedia Publications website (“Site”), and constitute a binding, legal agreement (“Agreement”) between the User and EduPedia Publications Pvt. Ltd. , referred as “EduPedia Publications”). Please read the information below carefully. By using the Site, you accept the terms and conditions described below, and you warrant and represent that you have the legal capacity to enter into this Agreement. When you post Content on EduPedia Publications, you keep your copyright, but you grant that EduPedia Publications will provide a service to post, display, copy, and sell that Content. If you include any information that could be used to identify you, such as your personal phone number, e-mail address or a government-issued ID number in your Content, it will be included with your Content when sold. By including Personal Data in the Content you post, you authorize EduPedia Publications to disclose that Personal Data as part of the Content. You may not include Personal Data about other people in your Content. To the best of your knowledge, all factual information in the Content you upload is true and accurate, and the use of any recipe, formula, or instruction in the Content will not result in personal injury to any person. Despite all this, EduPedia Publications cannot guarantee the accuracy, integrity or quality of Content. EduPedia Publications reserves the right to refuse to permit your publication on the Site of any Content that EduPedia Publications, in its sole discretion, deems in violation of the terms and conditions set forth above.
. Users are solely responsible for all the content they upload. Views expressed by members in their content are their individual views and EduPedia Publications is not responsible for any such views, expressions, ideas, comments, statements and content of the same. EduPedia Publications does not review the contents of a Books, poems and articles provided by the users in any way before they are published. 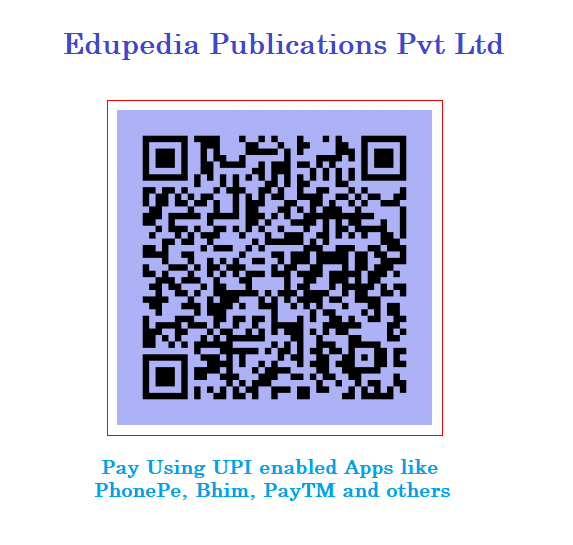 EduPedia Publications does not verify, endorse or otherwise vouch for the contents of any books, poems and articles published here. Users can be held legally liable for the contents of their books and may be held legally accountable if their books include, for example, defamatory comments or material protected by copyright, trademark, patent or trade secret law without the permission of the author or owner. The user agrees to indemnify and hold harmless EduPedia Publications, its employees, directors, officers, agents and their successors and assigns from and against any and all liabilities, damages, losses, costs and expenses, including attorney’s fees, caused by or arising from or in connection with the contents of the member’s book, including any claim of libel, defamation, violation of rights of privacy or publicity, loss of service by other members and infringement of intellectual property or other rights. All information provided by a user is strictly confidential. EduPedia Publications will not intentionally monitor or disclose any private information unless required by law, enforcement agencies, regulation or court order. Users agree to respect the privacy and confidentiality. Users acknowledge that their right to use the Service is personal to them, unless expressed otherwise. User agrees not to resell the Service without the express consent of EduPedia Publications. Users are entirely responsible for not maintaining the confidentiality of their password and account. Users shall be fully liable for all use of their account, including any unauthorized use of their account by any third-party. The writers would be receiving the amount they have earned (minus any applicable processing cost) though direct transfer to the bank account specified by them or through paypal. We may introduce other forms of payment from time to time which the writers can opt-in from their account. It is the user’s responsibility to maintain their correct address, paypal account id and other details required to correctly make the payments to them. If they miss a payment because of inaccuracy of information, EduPedia Publications will not be liable for the losses. EduPedia Publications pays the writers and poets for their valuable contribution to the content of this website in the form of book. You will get 50% of net profit as royalty of the book on yearly basis if the share of profit reaches Rs 10000/$200 or more. The lower amount will be carried forward to next year or so. Users can put a take down request for the content anytime. It will take upto a week for the take down to be effective. EduPedia Publications reserves all rights to fulfill the orders received in that period. Content may be retained in our archives to the extent required by or back-up systems, or at EduPedia Publications’s discretion, for archival purposes. Account deletion and removal of personal data may likewise take up to week to take effect. The authors cannot get the permission to republish the book from other publisher for at least one year. If author wish to withdraw his manuscript for any reason author must deposit a fee of Rs 10,000 or $200 for getting permission for republication or withdrawal of the manuscript from the publication. Such authors will be banned from further submission of book for publication in future. Users expressly agree that the use of the service is at their sole risk. The service is provided on an “as is” and “as available” basis. EduPedia Publications expressly disclaims all warranties of any kind, whether express or implied. EduPedia Publications makes no warranty that the services will meet the member’s requirements, or the services will be uninterrupted, timely, secure, or error free; nor does EduPedia Publications make any warranty as to the results that may be obtained through the service or that defects in the software will be corrected. User understands and agrees that any material and/or data downloaded or otherwise obtained through the use of the service is done at the user’s own discretion and risk and user will be solely responsible for any damage to their computer systems or loss of data that results from the download of such material and/or data. EduPedia Publications makes no warranty regarding any transactions entered into through the service. No advice or information, whether oral or written, which the member obtains from EduPedia Publications or through the service shall create any warranty not expressly made herein.